Monster Energy congratulates Pat Casey on his victory and teammate Andy Buckworth on taking second place at the first stop of the Toyota BMX Triple Challenge . Casey’s incredible riding put him a notch above a stacked field of riders at the very first BMX event of the year. The first stop of the three-stop series, the Toyota BMX Triple Challenge takes place during select Monster Energy Supercross events and is at the forefront of the progression in BMX. The Anaheim event is a two jump, no apologies trick event that appeals to both the best riders in the world and up-and-comers who are looking to make a name for themselves. Four straight days of rain prior to the event put strain on the construction crew, but two pristine (albeit a bit soggy) jumps were ready for 40-some-odd riders of all ages and capabilities. At no other event will you find 40-year old legend Cory Nastazio on the roll-in alongside 11-year-old phenom Rider Lawrence, but that’s the beauty of the Toyota Triple Challenge. Pushing into the night, the 40 riders absolutely sent it for one of the final 15 spots alongside overall winner, David Godziek, in the 16-rider semi-final. Lots of riders appeared to be saving their best stuff for the big show of the final competition, except Monster Energy’s Buckworth who came out firing by double flipping the first set straight into a no-handed front flip over the second. Joined by a stacked Monster Energy field for the semi finals to include Leandro Moreira, Colton Walker, Kevin Peraza, Pat Casey, James Foster, Alex Nikulin, and Monster Army riders Peyton Wessells and Brock Horneman, Buckworth ended the night in the top spot for the final eight. On the day of the finals the sun was shining, the dirt jumps were riding faster, and the semi-final pushed the field to just eight. Top qualifier Buckworth was methodical and perfect in his approach to finals executing a double backflip and a frontflip for his first run, double backflip and a no-handed frontflip on his second run, and a no-handed double backflip and a no-handed front flip on his final run. 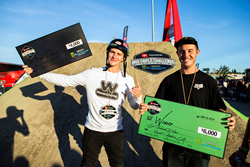 Last year’s champion Godziek pulled an insane 720 front flip followed by a cashroll, but it was Monster’s own Casey that appeared to be infallible. Casey has an incredibly busy year ahead, but he’ll be spending the next couple of weeks revamping his Dream Yard and working on a new project for Monster Energy before the next Toyota BMX Triple Challenge, which takes place in Arlington, Texas, on February 16th. For more on Casey, Buckworth, Moreira, Walker, Peraza, Foster, Nikulin, Monster Army riders Wessells and Horneman, and the rest of the Monster Energy BMX team visit http://www.monsterenergy.com. Follow Monster Energy on Facebook, Instagram and Twitter.